I tried to use Wi-Fi calling with two of my Tracfone Bring-Your-Own-Phone (BYOP) phones but it didn’t work. 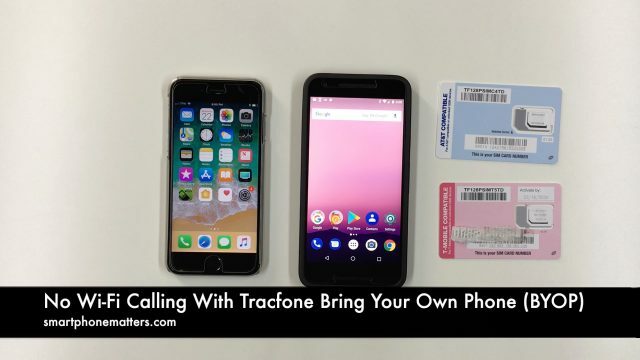 I currently have two BYOP phones active with tracfone. One uses Tracfone’s AT&T network, the other Tracfone’s T-Mobile network. A few people have asked recently if they can use Wi-Fi Calling with Tracfone so I thought I’d give it a try but it didn’t work for me. Tracfone also offers service on the Verizon network or towers but I did not have a chance to try that. If you want to use Wi-Fi calling, give it a try, perhaps you will have better results than I did. The rest of this article describes the details, read on, if so interested. I tried to use to use Wi-Fi calling in four different combinations of Tracone BYOP. None of them worked. I was unable to use Wi-Fi calling with Tracfone’s AT&T towers on my iPhone. When I turned on Wi-Fi calling settings, the phone displayed an error message. I couldn’t use Wi-Fi calling with Tracfone’s AT&T towers either. When I turned on Wi-Fi calling in the settings, it showed an error message. I couldn’t use Wi-Fi calling with Tracfone’s AT&T towers either. On my iPhone, the option to turn on Wi-Fi calling was missing when the Tracfone T-Mobile SIM was in the phone. I wasn’t able to use Wi-Fi calling with Tracfone’s T-Mobile SIM with my Android phone either. My android phone has an option “Wi-Fi Calling preferred”. I turned it on but Wi-Fi calling didn’t work either. I used my iPhone 6s and my Google Nexus 5X to try out Wi-Fi calling with the two different Tracfone SIM cards. I know that Wi-Fi calling works on both of these phones as I have used it before with other services that offer Wi-Fi calling as a feature. Needless to say I was disappointed. If you read the Tracfone Terms and Conditions of Service they state that Wi-Fi calling may work if both your phone and your SIM card support it for the tower or network you are using. You also are supposed to visit https://e911-reg.tracfone.com/ to check if your phone or SIM will work with Wi-Fi calling. Most people talk to Tracfone customer support are told that Wi-Fi calling only work with Tracfone’s T-Mobile network and wit “selected” phones. I thought that Wi-Fi calling might work with the Tracfone AT&T SIM. Last year, Wi-Fi calling suddenly started working for Straight Talk customers using their ATT towers, and Straight Talk is a Tracfone brand. Even though Wi-Fi calling worked for Straight Talk, the company said it was not supported and if you checked your phone number and SIM at a href=”https://e911-reg.tracfone.com/” rel=”noopener” target=”_blank”>https://e911-reg.tracfone.com/ it would report Wi-Fi calling was not available for your line. I thought their was a better chance of Wi-Fi calling working with the Tracfone T-Mobile SIM. When I checked phone number for my Tracfone T-Mobile SIM card at a href=”https://e911-reg.tracfone.com/” rel=”noopener” target=”_blank”>https://e911-reg.tracfone.com/, it said my it would work with Wi-Fi calling, but it did not. Tracfone also offers service on the Verizon network or towers but I did not have a chance to try that.